Man’s best attempt at creating a life-sustaining ecosystem—would it work? In 1991, eight people voluntarily sealed themselves inside a three-acre collection of domes for two years, cutting off air, water and food from the outside world. The volunteers planned to receive everything they needed to survive from inside the glass domes, collectively called Biosphere 2. They grew fruits and vegetables and raised goats and chickens for food. They recycled every drop of water they used—condensing water from the air and reusing waste water for the plants. They didn’t want to take oxygen from the outside world, so Biosphere 2 was totally sealed. It was more airtight than the space shuttle. In order to keep the air inside oxygenated, plants grew everywhere, especially in the rainforest area; the abundant plant life soaked up carbon dioxide. It was an experiment unprecedented in scope and ingenious in design. It was expensive too—construction alone cost over $150 million. No one had attempted to create a complete, separate ecosystem like this before. Like Earth, which draws energy from the sun, the only thing Biosphere 2 would draw in from outside was power. In September 1991, the eight inhabitants (“biospherians”) began the first of what was to be 50 two-year missions. Located just north of Tucson, Arizona, Biosphere 2 looks like a giant greenhouse. It is now open to visitors, and I took a guided tour there in September. No one lives in it now—but I saw the trees the biospherians had planted as saplings 20 years ago, and learned the story of the experiment’s thrilling conception and painful demise. Walking through the Biosphere is like walking into new worlds again and again. Stepping through the living quarters, we entered the first “biome,” a lush savanna that flourished atop a steep, three-story cliff. Peering off the cliff, we watched gentle waves roll across a million-gallon ocean, complete with an ecosystem of fish and coral. We learned that the fish there are not fed—they feed off each other, as in the wild. From the savanna, we passed through two sets of plastic curtains and instantly began sweating. We had entered a desert, as brown and hot as the savanna was green and cool. Here, the biospherians had studied the effects of drought. From the scorching desert, we passed through two more sets of curtains and encountered a heavy mist we could barely see through. We had entered the oxygen factory, the rainforest. Trees and vines grew to the top of the 60-foot ceiling. We then headed downstairs into what was called the technosphere. To support the three acres of land inside Biosphere 2 above, there were over two acres of supporting machines in the basement. The technosphere distinctly contrasted the natural beauty of the biomes above. Here, stiff concrete walls surrounded us. Massive mechanical water pumps circulated and treated water. Giant fans pushed air through the corridors and up above. There was even a 158-foot-diameter circular room called the lung. At the top of the lung was a massive metal sphere, affixed to the walls by a flexible rubber sheet. At night, when Biosphere 2 was cool, the metal hung only a few feet above the floor. Then, as the sun rose and the air inside the biomes heated and expanded, the pressure would push the metal sphere up. It was awesome and frightening to stand under the 16-ton metal sphere that was suspended only by air pressure. 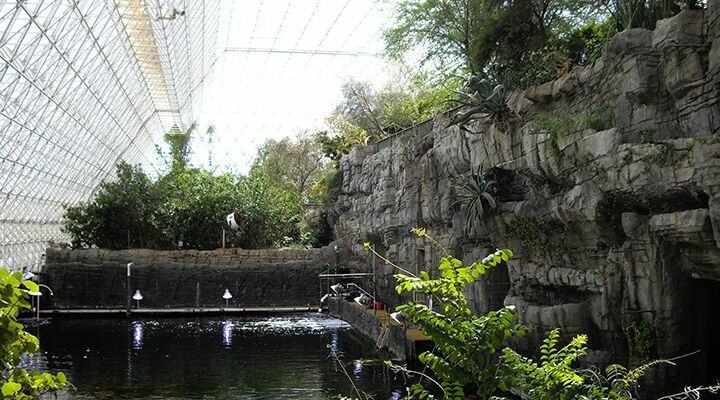 Without this lung, the pressure changes inside Biosphere 2 would have caused the glass structure to explode. No doubt, Biosphere 2 was an incredible achievement. But for all the brilliance of the design, for all the money poured into the structure, for all the high hopes and diligent work of those involved, it didn’t quite work right. It was meant to be completely sealed for two years. Sixteen months in, however, the biospherians were losing too much oxygen. The balance of plant life had not been correct, and carbon in the atmosphere was rising to dangerous levels. Though the cause was eventually discovered, there was no way to reverse it. The team either had to pump in extra oxygen from outside, or end the experiment. They pumped in the oxygen. Other unforeseen complications arose. Food was more difficult to grow than expected, and after one year the biospherians had lost 10 to 18 percent of their body weight. Eventually, extra food had to be imported. Partly because of these problems, the scientific community wouldn’t take the project seriously. Shortly after the first experiment ended in 1993, funding dried up, and Biosphere 2 was put up for sale. MotherNature. I laughed to myself at that. Biosphere 2 represents the pinnacle of human achievement in creating a life-sustaining ecosystem. Hundreds of brilliant minds—scientists, engineers, builders—considered and discussed thousands of technical details needed to sustain life. The biospherians were extremely careful to care for their environment, avoiding all chemicals and pollutants (nothing from perfume to chemical fertilizers was allowed in). And still, Biosphere 2 couldn’t quite sustain life on its own. Yet here we live on Biosphere 1—Earth—which functions flawlessly, despite man’s lack of care in its stewardship. Could this remarkable life-supporting planet have happened by accident? I left Biosphere 2 with, more than anything, wonder and gratitude for the remarkable intelligence of the Being who conceived, planned and built the remarkable ecosystem we live on, draw breath from, and survive in without thought every day—Planet Earth.